Edge of Tomorrow is a live-action film from Warner Brothers studio, based on the Japanese light novel All You Need is Kill (by Hiroshi Sakurazaka). It released in some parts of the world (such as the UK) on May 30th, then released in most other territories (such as the USA and Canada) on June 6th. The two main characters are played by Tom Cruise and Emily Blunt. To my surprise, the film is being well-received by most critics (at the moment an 89% fresh rating on Rotten Tomatoes). I hope it does well–as far as I’m aware, this is the first time a light novel has been adapted for a Hollywood feature. 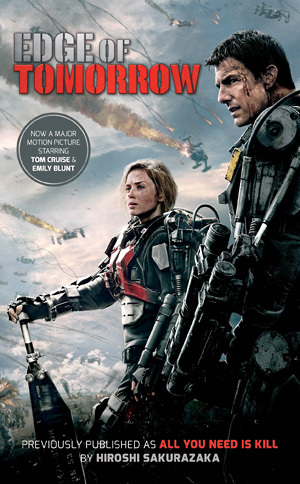 It should generate more interest in the All You Need is Kill novel at least, which is now available in a reprint “Edge of Tomorrow” tie-in edition. From what I understand the text is unchanged from the original translation, so it is not a new novelization for the film. Most people who see the film won’t know to look up “All You Need is Kill” to find the novel that the film was based on, so having a reprint with the film title will help them find what they’re looking for. If you want to read All You Need is Kill and you specifically want the cover with Tom Cruise on it, you can purchase it on Amazon or Barnes and Noble. Paperback copies are about $7, but you can also buy an audio CD or an Audible audiobook if you prefer. You can, of course, still obtain the original version released by Viz Media from Amazon and Barnes and Noble as well, either as a paperback or as a Kindle or Nook ebook. To help prevent potential confusion, I will inform that there has been a Western graphic novel recently released as well, this one using the All You Need is Kill title. (Don’t ask me why.) It is illustrated by Lee Ferguson and adapted by Nick Mamatas. Please note that this is different from the manga adaptation illustrated by Takeshi Obata (of Hikaru no Go, Death Note, and Bakuman fame), which is currently being serialized in Japan via Weekly Young Jump, as well as in English through Viz Media’s digital Shounen Jump. I generally only see one or two films a year (I’m just not a movie person), but I may be willing to give Edge of Tomorrow a shot. I will have to wait until July 4th at least though, as that is when it will release in Japan. (Note: It will be using the original All You Need is Kill title in Japan.) I’m going to read the novel in the meantime though, so I’ll see about posting a book review some time this month.